In July 1985 I worked for an electrical retailer in Glasgow, where I had been employed since 1975. I was, in 1985, a storeman with the company and, because I had not made any holiday plans for that particular summer, I had not booked any holiday dates with the company. The chances of me being allowed time off in August – high summer – were really non-existent, because everyone else had already booked their dates and a number of people were already booked for holidays in August, meaning that I would not be allowed a holiday in August at short notice. One Saturday evening in late July, I went to a Christian meeting at which an appeal was made for people to volunteer to join a mission team that was due to depart for Belgium only two weeks later. This mission had been arranged at very short notice at the request of a church in Belgium, and so it was urgent to find people who were able to go. I spoke to LaVere Soper who was going to lead that mission, and he strongly encouraged me to sign up. He was not at all fazed when I said that I would never get holidays granted in August as it was short notice and that everyone else had booked their dates. Having encouraged me to pray about it, we left it that I would make contact if I could get the time off from work. I left the meeting knowing that it was a dead end as I would never be allowed a holiday in August at such short notice. I went to work on the following Monday morning, I spoke to my boss and, to my utter amazement, I was allowed to be on holiday for two weeks in August. This meant that I could sign up for the mission to Malonne that was taking place from 9th to 24th August. I was somewhat stunned. I had never believed that I could be allowed holidays in high summer at such short notice. So I had to fulfil what I said I would do and I contacted LaVere with the news. Twelve people actually signed up for that mission, but to call them a team would be unfair to the word. We were twelve very different individuals in each of whom God had a major work to do, and it seemed he was sending them all to Belgium to do that work in them together; but that also he somehow wanted to work through them to the people there in Belgium. Of course, none of us had any idea what lay ahead. This photo below actually shows part of the team as we were preparing to leave after the mission had ended. 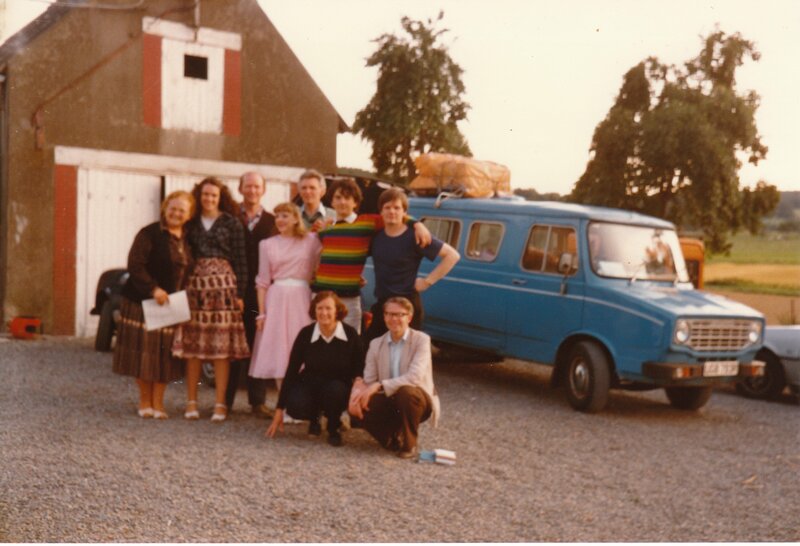 Twelve people packed into a little minibus with all their luggage and barely enough room to breathe for eighteen hours as we travelled to Belgium was certainly a way to begin to get to know each other. The driving was shared between LaVere Soper, mission leader, and Fraser Ogston, assistant to LaVere. When we arrived in Belgium, the first sight that greeted us was the local church folks erecting a large tent for the meetings that would be led by the ‘team’ that they were expecting. We met the pastor, Francis, and his wife Ingrid, both of whom had full time jobs as well as leading the church. John Weeks became our diary person and, at the end of the mission, he wrote an account of what we had seen and heard. His account is on a subpage that you can access below. On a separate page accessed from below, you can see photographs from that mission. I scanned the photographs both to make them available and to save them – as printed photographs deteriorate over time. I am amazed that the photographs that I had from so long ago were mostly still in good condition, and I wanted to keep them safe in digital format. What follows next here is my own brief reflection on that fortnight. It was virtually two weeks of non-stop ministry – both in receiving and in giving. I was broken, restored, renewed and astonished at the work of God in me and through me. There was little time for sleep, though we mercifully got one day off each week so that we could relax, go sightseeing and also be invited out for dinner by a lovely lady. From early morning to late night we were ministering in the power of the Holy Spirit and seeing God do simply amazing things moment by moment. God did an astonishing work in many people’s lives and the ripples of power spread strongly outward as the mission went on, thereby impacting an ever-increasing area and bringing people from many miles around to the tent. There were so many amazing stories of healing, deliverance, and God’s power at work in so many different ways in so many people’s lives. As John Weeks would record in his account, only heaven could reveal the true extent of what God did there in that time. It was an event of a lifetime for me, and I am profoundly grateful to have been a part of it for that fortnight. It certainly was an astonishing time of blessing for me, but it was also a time of breaking – as the page “In The Hand Of The Potter” beneath recounts. I long to see an openness in God’s people here in Scotland and especially in Edinburgh that will allow God to move here as he did in Malonne during those two weeks. May it be so for the glory of Jesus.